We are excited to announce that the we will again be hosting the Historical Fiction Reading Challenge in 2013, and we hope that you are all excited at the prospect of joining in. The challenge will run in the same way as it has over the last couple of years that we have hosted the challenge. The only thing that has changed is the names of the categories. You can tailor the challenge to suit you in whichever way you like! For example, I know of one participant who over the last couple of years has only read historical mysteries as it suits their own reading tastes! To join the challenge you only need to make a post about it, grab the button below if you like and leave your link in Mr Linky below or just leave a link to your blog if you are not yet ready to post about it yet. If you don't have a blog you can just leave a comment for this post saying that you are joining. The challenge runs from 1 January to 31 December 2013. Thanks to Alex for the gorgeous button again this year! I am working on getting a button with the HTML. Check back soon. Alternatively save it to your PC and upload from there. Great - thanks for that, Marg. I am joining in for 2013 but not ready to create a post yet. That's fine Annette! Welcome to the challenge. I did not choose a level when I signed up Nov 28. My goal is Medieval at 15 books, but I may read more. Sounds great! And my novel "Venus in Winter," about Bess of Hardwick, will be out July 2. I would love to do it! I don't have a blog so please let me know if I need to do anything else! I can link to my Goodreads or Facebook account if you like. I am very excited as I read mostly historical fiction anyways so this should be easy peasy :)! Count me in! I am cutting back on challenge participation next year, but this is one of my favorite challenges, so I can't resist. I'll post about it sometime next month. Thanks for hosting!! I would like to do this! This is my first year and I've just started getting into blogging since I got married. I will link up my blog above! Welcome to the challenge Lara! I would love to be part of this. One thing I am not sure of (sorry, I am new to this) the books we choose have to be published in 2012 or during 2013? Or can they be from previous years as well? Marie, you can read new or old books. Up to you. Thanks, Marg. That's perfect since I have a suitable batch on my To-Read list! I'm so glad you're hosting this again next year! It's one of my favourite challenges and one that I know I have a good chance of completing. I love the button too! Thanks for hosting this. I'm looking forward to another year of wonderful historical fiction! I added a shelf for this challenge. Haven't figured out what level yet. I've never been much of a historical fiction reader, but this past year I read a few that I really enjoyed! I'm going to aim for five and I'll be doing this through my Christian fiction blog, hence it will all be historical Christian fiction. I'm in...This is my first ever challenge..I'm excited. How exciting to be embarking on your first challenge! Welcome. I'm going for Ancient History!!! I would like to participate. This is my first challenge. If we re-read a book does that count also? I like to re-read books I have enjoyed. I had fun taking the challenge this last year so I'm signing up again. I have a huge TBR pile so I'm going for the gusto with the Ancient level. I'm a newbie to this sort of challenge so I'm hoping to pick it up as I go along. I read 31 HF books last year but I'm setting my sights on Medieval as my resolution is to read less HF and more classics, history and biography in 2013. Let's see how that goes. I misinterpreted the reading levels when I first posted about this challenge but have since updated my page to reflect that I'll be aiming for the Ancient History level. This should be a piece of cake for me since I've read over 50 works of historical fiction this year. it should be a piece of cake for me too, but I think I am going to restrict myself to only Australian authors to make it more of a challenge. Not 100% decided yet though. Thanks for hosting this challenge again, Marg. Love to learn about everyone's choices and read their reviews! 2013 should be a great year for historical fiction, especially if Diana Gabaldon gets Written in My Own Heart's Blood published, don't you think? Happy reading! It should indeed be a great year for historical fiction! I just signed up, since most of my reading is HF this challenge caught my attention right away. Just linked up. Can't wait to start! Thanks for the challenge! I'm still working on finishing the 2012 Challenge but plan to increase my number of books this year to Medieval. It is my area of expertise in literary terms, after all. I do like the idea of using Goodreads to keep a list of the books read and reviewed. I adore this challenge -- will work on my post this weekend -- gorgeous button this year! I just found your blog and this challenge - I am really looking forward to the challenge! Just signed up. My second year. Looking forward to reading lots of historical fiction this year. Mostly historical mysteries for me. I have a few historical mysteries that I need to get to soon! I am excited to join I will be doing the victorian level!!! So, excited!! Definitely joining the Ancient History level! I'm going to go for Ancient History! This will be my first (official) challenge, so excited! I'm aiming for the Victorian level. Thanks to Kim @ Confessions of a Book Addict for linking to this page! Thanks to Kim! I hope you enjoy your first challenge! Reading many genres is important but at times its nice to have a bit of direction in your reading so I am looking forward to this challenge. I'll come in as a Victorian reader. I will accept this challenge and look forward to seeing how well I do. Thank you for hosting this challenge. I am excited to be participating in my first book challenge. I haven't done this challenge before, but I think I will try for 2013, hopefully Renaissance Reader. I have an inactive blog--maybe this will prompt me to come out of retirement! Yay for coming out of bloggy retirement! Good luck with your challenge! This is my first ever reading challenge and I'm hoping to become a Renaissance Reader! Thanks for hosting this challenge. Welcome to reading challenges! When I first started them I got totally addicted! I love historical fiction. I am hoping to become a Renaissance Reader. I recently moved from a fairly established blog to my own and although the prospect of doing things alone is daunting, I'm glad I came across this reading challenge. It looks fun and I have a few books in my to be read pile. This is my second year, hopefully I'll do much better this time around. I'm going for Renaissance Reader. Good luck everyone! Looking forward to becoming better acquainted with the genre! I'm in! I don't know how high I'll aim, but honestly I should be able to reach the Ancient History easily on mysteries and historical romances alone, before I add in fantasies and regular fiction. 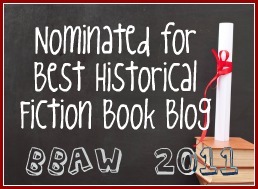 I love historical fiction so I'm totally up for this challenge! I was just wondering if there was anyway to get higher levels? I read a lot of HF and 25 isn't really a challenge for me, and I think it would be cool to have a higher goal to reach! I always read 50 or more myself. You could always set your own goal to make it more challenging! I'm going with "Anonymous" only because my most commonly used only ID is with Yahoo -- and that's not an option here! My name is Mona and historical fiction is one of my favourite genres. I'll be going for the "Medieval" level. I too have to go with "Anonymous". My name is Diane and I would love to join this challenge as a Renaissance Reader. Thank you so much for hosting this challenge! This is perfect for me! This is my first time with this challenge and I am really looking forward to this one. Thanks so much for hosting and for having such a cool button. Well, I pushed myself with the Global Reading Challenge last year and found many authors I would not otherwise have discovered. This year I'll try to push myself outside my normal reading genre (mysteries) and do some historical fiction. Good luck with stretching your boundaries this year! Will be joining in at the Renaissance Reader level. I've developed a love of historical fiction over the last year. I will join at Ancient History since I love to read and historical fiction is becoming my favorite genre. I am looking forward to this challenge. I'm not sure which level I'm interested in, but I'm looking forward to the challenge! First time joining challenge; joining at ancient history level. I have the reading part down; now I have got to learn about blogging. I am sure you will catch onto the blogging side of it too! If you need any help feel free to email us. We will help if we can. This is my first time participating in a challenge here - looking forward to it. I've given the link to my Goodreads page as I'm not sure yet where I'll be posting reviews. I'll let you know. I'll aim for Renaissance Reasder level to start with. Oops - I forgot to say that I've signed up as "Caz" which is my GR name - sorry, I get mixed up with all these different profiles! I have so many HF in my TBR! I'd be happy to get these read FINALLY! Have fun everyone and good luck! I'll come in at Victorian Reader, but if I end up reading more historical fiction (which is extremely likely for me), then I'll upgrade my challenge selection. I am joining this challenge. Since I belong to two book groups, I will plan to read at least 5 historical fiction in addition to whatever we read in my book groups. I would love to try this challenge - have never done one before. Some uneducated questions - are the levels listed for books read per month, eg 20th Century Reader is 2 books per month? Will the posts give us guidance for choices of books? I post my reviews to Goodreads, but I'm not sure how I would share those with the group. Thanks for any advice, this will be fun. Hi Katharine, the challenge is for the year as a whole. If you want to find some more books to read, then check out the list of links that will go up at the start of each month. In terms of your Goodreads review, you can add the link for the review into the list as you post them. If that isn't clear, then leave a note here and I will try to explain further. Hi anonymous, if you have a blog just paste the web address into the bottom box of the Mr Linky in this post and your name in the top box. when you write a review, you would write your name and the book name in the top box on the post for the month and then the link to the web address in the bottom box. I've never done a challenge but it looks like lots of fun - virtual book club! I am just about to graduate from work, so the Ancient History challenge sounds just the thing. Thanks for organizing! Hi there, we are pretty relaxed here so if you count it as a 2013 book then we will be happy with that. I always count books in the month/year I finish them! I signed up for Victorian Reader though I am sure that will change! I wish to join the challenge but I am new in this and I have a question. I know its a silly question but still I need to ask this. When you say Victorian novels does that mean novels written on that era or any novel that is written about that period? Hi Sangita, the levels are just fun ways to describe the different levels. You can read from whatever era or about whatever subject you like. Thank you for replying Marg. dropping by and joining the challenge! I have another query, please could you tell me after posting the review how shall I contact you? Is there any link regarding the completion of the challenge? Each month we put up a post where you add the links to your reviews. I love participating in this challenge...it's a great way to find new titles to read, too! As a big fan of historical fiction, I am looking forward to participating in this challenge in 2013 and reading about wonderful new authors I haven't yet encountered. Thanks for hosting! I've been looking for some good challenges to join for 2013, and this one sounds great! I'm excited to start. This is my first year joining the challenge. Thanks for hosting! I'm going for the Victorian level. It's the first time I join a reading challenge and I'm very excited about it! I'm aiming for the Renaissance Reader level. Thanks for hosting! I'll be joining in for 2013! Ancient History for me - shouldn't be too much of an issue given the 50+ historical mysteries last year. Joining :) I don't have a blog but this is a great thing for me cause I love to read! LOVE IT! Thanks for hosting the challenge. I think I will be a little relaxed about it and only shoot for Victorian Reader level. Hello! Very few let you join with your general blog. I really appreciate you letting us get started, squeezing out a post when we have time. Thanks for hosting! I'm looking forward to it. I've signed up! Sounds great and LOVE the banner! I'm so glad I found this because I am aiming to read a lot of historical fiction this year! I want to sign up for Ancient History. This is my first book challenge - starting with the Renaissance Reader. Looking forward to it! I love this challenge! Victorian reader. I am joining, but not ready to post yet. Signed up for medieval. I just started Sharon Kay Penman's When Christ and His Saints Slept so I'm definitely looking forward to this challenge. Already started the reading! Thanks for hosting! I will be doing the Medieval, because I read a huge amount of historical romance every year, so 15 books over the course of 2013 should be a doozy. I've already read one book that qualifies, before even realizing this challenge existed. Great idea for a reading challenge! Yeah, I'm upgrading to Ancient History, or I'll have completed this challenge before the end of March. I've already read and blogged 5 books that count as historical, even though most are fantasy. First year joining. Looking forward to it. This is my first challenge...looking forward to it! Thanks for your enthusiasm everyone! Ahh... the ever tricky question of defining historical fiction! Personally I don't think that soemthing was contemporary when it was written but is historical to us is historical fiction. In terms of where the line is, I would probably go with anything set more than 50 years ago, but that is kind of flexible. For example, The Help is set less than 50 years ago but it is very clearly a snapshot of a place and time that is clearly in the past now. I'm glad to have your vision of the theme (I love to do well in competitions knowing I've honoured the rules). I can look at my books and gauge which level to post. Your 50 year estimate = publications up to 1962. I'll see that I choose the ones that respect your parameters of a clear period snapshot. That's what I meant. This is my first year to participate in a reading challenge, but I'm in! I've added my link above. Hi Valerie & everyone in this group! I'm a Canadian who has never willingly read much historical fiction by its popular definition; you know how dull school books can be! I do like Susan Wittig Albert's "Cottage Tales" about following Beatrix Potter but this is pretty much new to me. I hope to become a Renaissance Woman (10 books) for 2013. Looking forward to this challenge! That combo link would be: http://cmriedel.wordpress.com/2013/01/21/guilty-country-historic/ . I plan to read 5 and am very excited to join this challenge. My first challenge, but, hopefully not the last. I am joining again this year! Hopefully I will get to read more fiction than last year, as last year I read more non-fiction history books than anything else! This sounds interesting and I love connecting with other readers/writers of historical fiction! Many Regards & I am looking forward to folks posts! I must add the 18th century is my passion and will be my focus for my posts: The Age of Enlightenment. I'm joining in too and am aiming for 5 books. Thanks for hosting! I plan on joining again and reading as much historical fiction as I can this year. I don't have a specific post about joining the challenge,but plan to add my links as I go along. Is there a link for February reviews yet? What a great way to share love of history! Can't wait to see what everyone is reading. So glad I found this site! Love historical fiction and can't wait to jump in! Its good to be a part of the challenge.. Thank you! Isn't it lucky housework will always be there in the morning? I just linked to my fifth Historical Fiction review! I am now officially a Victorian level reader. My fifth historical novel for this year was The Last Runaway, by Tracy Chevalier, and it was absolutely excellent. Two thumbs up! I found you kind of late, but will post at least one book per month hopefully. I found you rather late, but will try to post one book review per month for the rest of the year beginning in June. I can't believe I didn't find this challenge sooner. I hope it's not too late to join in! I so hope I can still join in. I can't believe I didn't find this challenge sooner either! How do you choose your books for the challenge or is that a silly question? I too can't believe I didn't find this challenge sooner. I hope its not too late for me to join either. This sounds like fun. Can't wait to get started. Wished I had found it earlier, but I'm glad it's not too late. thank goodness for surfing the internet way past midnight... or I'd never have found this challenge. Since I'm a late starter... I'll do 20th century reader - 2 books. Now to go grab the button! yippy! I LOVE HISTORY AND I LOVE READING! I'm officially joining :D i really hope it's not too late though. I'm very excited as this is my first ever book challenge. I LOVE HISTORY AND I LOVE READING! I'm officially joining :D I hope it's not too late though. I'm very much excited as this is my first ever book challenge. Is there going to be a link for the August books? I'm in! Thank you for hosting!